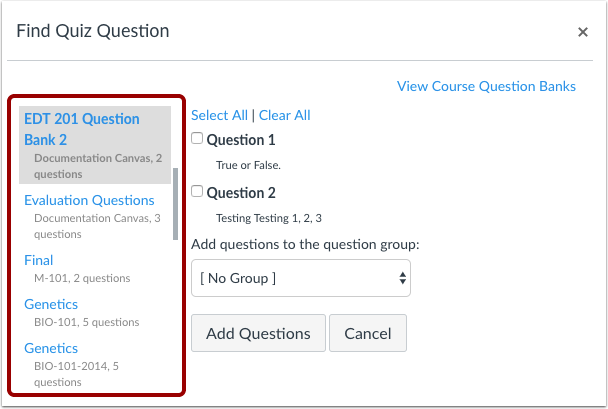 When you find questions in a Question Bank, you will see all of the Question Banks that you have built in other courses where you are the Instructor. You will also see Question Banks that have been added by your administrator to your sub-account, which makes it easy for instructors in the same department or program to share resources. If an outcome is aligned to a question bank, referencing the question bank in a quiz will also import the associated outcome to the course. 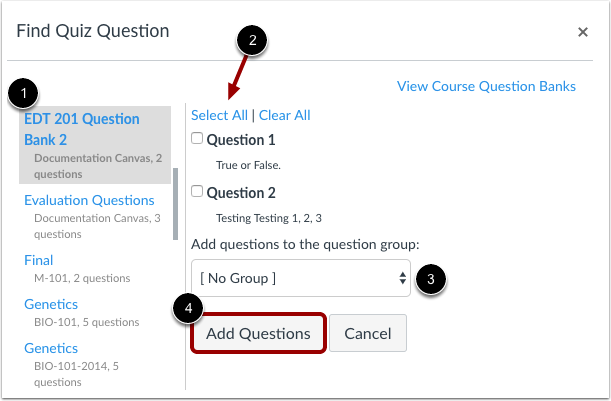 Canvas will reference the questions you choose as each student takes the quiz. These questions will stay in sequential order and stay in order each time the quiz is taken or previewed. If you want to randomize quiz questions, you can add them to a question group. 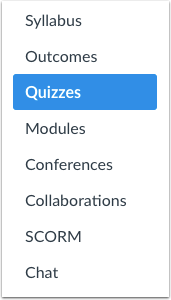 In the Details tab, enter the name of your quiz . In the Rich Content Editor , introduce your quiz with formatted text, images, video, or sample math equations. You can even use the media commenting tool to record an introduction to the quiz. Complete the rest of the quiz details . Check the boxes next to the questions you want to add to your quiz . If you want to select all the questions, click the Select All link . When you've selected all the questions you want to use, click the Add Questions button . When you click the Select All link, Canvas selects only the questions that currently appear in the window. If you have more than 50 questions in your question bank, click the More questions button until all the questions you want to select appear in the window. If you set a question group to randomly select questions from a question bank, the questions will not be included in quiz exports. The QTI file will download quiz details, but no questions will be included. Note: You should not publish your quiz until it is your final product. If you are ready to publish your quiz and make it available to students, click the Save & Publish button. Previous Topic:How do I create a quiz with a question group to randomize quiz questions? Next Topic:How do I create a quiz with a question group linked to a question bank? Table of Contents > Quizzes > How do I create a quiz by finding questions in a question bank?